Pauciarticular arthritis, seropositive rheumatoid arthritis, autoimmune disorders, leukemia, sickle cell disease, child abuse, and infections are causes of joint problems in the child’s hand. Juvenile chronic arthritis is most common. Accurate diagnosis Make an accurate diagnosis and refer the patient to a rheumatologist. New disease-modifying agents are potent and require close, experienced medical supervision. Family education Explaining management principles with the family improves compliance and reduces anxiety. Describe the basic features of joint anatomy, including the synovium. Describe the disease, the synovial inflammation, and the effect of inflamed synovium on the joint and muscle function and how it can cause joint damage. Role of splinting Prescribe resting splints when the disease is active and joints are swollen and hot. Therapy Exercises are important but should only be performed within the range of comfort. Pain is not gain—it is a warning sign. Intraarticular steroids Inject steroids into the small joints of the wrist when medical treatment fails to reduce the inflammation. Improvement is often dramatic and long lasting. Single injections are usually adequate. Apply gentle traction to open and find the joint. Inject triamcinolone, or another depot form of steroid, into the joint using a 26-gauge 3/8-inch needle. Operative procedures are much less commonly required because of the increased effectiveness of systemic care and steroid injections. If deformity develops, surgery may be required. Synovectomy Medical care has largely replaced synovectomy for both the wrist and fingers. Rarely, when repeated injections fail to reduce the synovitis, synovectomy may be indicated. Wrist Fusion or resection arthroplasty are effective. Avoid joint replacements in the child. Surgery provides pain relief, deformity correction, and preservation of muscle function. Arthrodesis is indicated for severe malalignment about the wrist. The procedure is reliable when performed in late childhood or adolescence. Small implants may be needed. Carpal resection may be necessary to align the wrist before fusion. Darrach resection arthroplasty of the radioulnar joint is effective and often combined with wrist fusion procedures. MCP joints Deformity is now seldom severe enough to require treatment. If severe, fusion of the joint may be helpful if the IP joint motion is adequate. Implant arthroplasty may be appropriate in some cases. 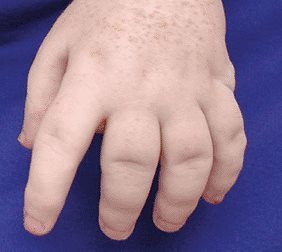 Fingers Arthritis in children causes stiff joints. Deformities severe enough to require operative correction are uncommon. Problems include swan neck deformities. Boutonniere deformities are most likely to cause disability. Boutonniere deformities, or flexion contractures of the PIP joints, cause little functional problems when less than about 60°. If the deformity is more severe and limits function, fusion of the IP joint in about 30° of flexion may be helpful. Thumb deformity usually consists of fixed flexion of the MCP and adduction contracture. If disabling, MCP arthrodesis combined with a adductor release is effective treatment. If only the IP joint is involved and symptomatic, consider arthrodesing this joint.